Smart rings are a tricky thing to get right. Tech companies have a hard enough time miniaturising all the necessary sensors into a watch, let alone a ring. That’s why the Motiv Ring was compelling when it launched in 2017—it stuffed three days of battery life, heart rate monitoring, and your usual step and activity tracking into a sleek and chic ring. When you consider that, the Motiv Ring is pretty impressive from a technology standpoint. But at $200 (£157), its middling accuracy made it more of a niche wearable. It was comfortable to wear to bed, and didn’t look like utter trash, but couldn’t really offer much in the way of smarts, like notifications, the same way wrist-based trackers could. Plus, it wasn't available in the UK, which didn't help either. But a recent update, along with the ring's new UK availability, made it so you can now use the ring as a form of two-factor authentication for a wide variety of popular sites including Amazon, Google, and Facebook. The short of it is, the ring, which costs £200, connects to your computer over Bluetooth. You then go to the supported site where you will have the option to view a QR code. You scan it with the Motiv app on your phone and your ring is then bound to the site and can securely log you in. Strategically, the addition of 2FA is a pretty smart move for a wearable that’s always going to play second fiddle to smartwatches, which can just do more for a similar price. Or it would be if it worked reliably. When testing out the feature, I had issues pairing the ring to my computer. It just plain wouldn’t work on my 2018 MacBook Air at home, and took two or three tries on my MacBook Pro at work. Conversely, scanning the QR codes for my Google and Amazon accounts went smoothly. It was logging into them that drove me nuts. 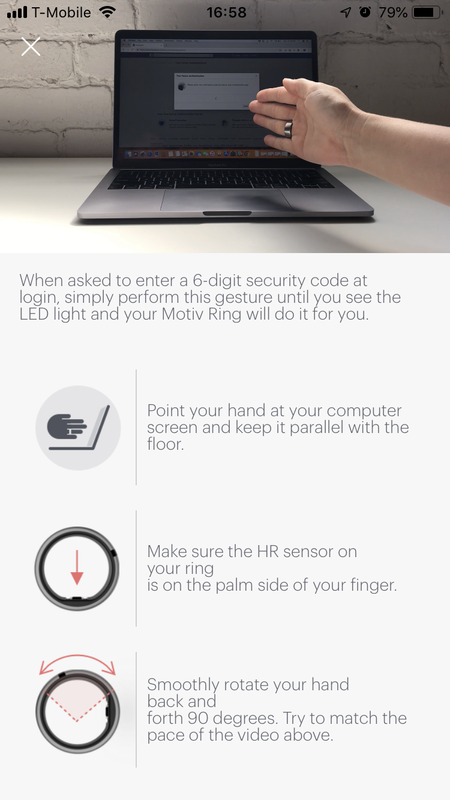 Ideally, I’d want the ring to talk to my computer whenever I needed an authentication code without my having to do anything. As it is, you have to wave your hand in a “ehhh this is so-so” kind of gesture while pointing at your computer. It sort of looks like you’re telling your laptop that it’s doing a meh job at life. And you have to do it over, and over, and over again until your arm is about to fall off while the box where the code is supposed to go remains empty. I actually never got this to work successfully. I tried troubleshooting—making sure the ring was situated correctly with the sensor palm-side down. I experimented with various speeds and watched Motiv’s video, miming it in real time. Nada. I reached out to Motiv, and they gave me another FAQ. This time I learned the ring should be on your three middle fingers. I was also told to think of the gesture as the same as unlocking your front door, advised to keep my hand extended straight and rotate my whole wrist. I unpaired, then re-paired, and re-set up the whole process again. Yet when it came to doing the open gesture, it still did not work. Fed up and in desperate need of accessing my Amazon account for last-minute Christmas orders, I ended up just entering the authentication codes manually. I know the feature theoretically works. I saw it in action during a private demo with Motiv a few months ago, but even then it took multiple tries. While it’s nice that you’re not reliant on the gesture, it’s frustrating and defeats the purpose of this otherwise very cool idea. If I have to whip out an app and look up codes, Motiv isn’t different from any other authenticator app. Also disappointing is its WalkID feature, which is still in open beta, with no exact timeline for when it’ll be available. This was supposedly, going to act as a form of biometric authentication where the ring would be able to identify you by your unique gait. So, if someone else put on the ring, it would theoretically be able to tell and wouldn’t log you into your 2FA-enabled sites. Again, a very cool idea, but one that needs to be executed flawlessly if it’s going to work. Which brings me to the issue with the Motiv Ring in general—accuracy. While the ring is great from a wearability standpoint, it’s not the most accurate. It’s not great for athletes looking to seriously log their training routines, but it is a solid option for the casual user who wants to get a big picture of their weekly activity and doesn’t mind if the ring gets it wrong every now and then. That said, when it comes to security, Motiv has to get it right and it has to be easy. As it is right now, it’s neither of those things. Maybe it’ll get better with future updates, but for now, Motiv definitely has a few kinks to work out.